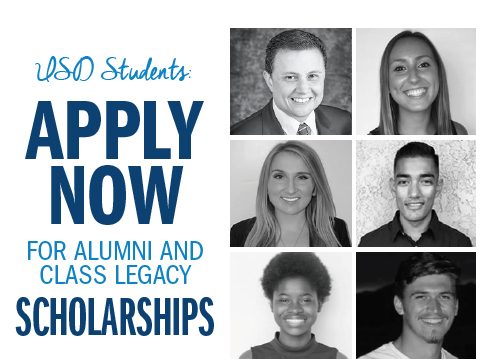 Scholarships are an essential asset for University of San Diego students and it’s a good reminder that applications for USD alumni and class legacy scholarships are being accepted up until the Feb. 25, 2019 deadline. Sponsored by the USD Alumni Association, USD alumni donors and all students who’ve made a G.I.F.T. to their Class Legacy Scholarship, there are six scholarships available — some specifically for undergraduate students and some that are open to graduate students. The six scholarships are: the Alumni Endowed Scholarship, which is open to graduate and undergraduate students; the Daniel L. Burkett Memorial Scholarship, which is open to undergraduate students who are active members of social fraternities and sororities; the Comité México Scholarship, which awards graduate and undergraduate students with Mexican or Mexican-American heritage; the Kyle O’Connell Memorial Scholarship, which is open to graduate and undergraduate students who have majors in the sciences, nursing or counseling; the Therese Whitcomb ’53 Scholarship, which is open to undergraduate students, especially transfer students; and the Class Legacy Scholarship, which is open to graduate and undergraduate students, and even graduating seniors. The College of Arts and Sciences this week announced that University of San Diego alumnus Robert O’Connell and his wife, Darci, have set up the Robert E. (‘82) and Darci M. O’Connell Scholarship for a USD student, which will not only award funds for tuition but will also grant a paid internship at the Timken Museum of Art in Balboa Park. We are grateful to Robert and Darci O’Connell for their generous contribution to USD’s Department of Art, Architecture + Art History and their commitment to the arts. More details will follow about the scholarship and when it will be made available. To learn general information on all scholarship opportunities at the University of San Diego, please visit USD’s Office of Financial Aid webpage. To donate to an existing scholarship fund or to create a new scholarship fund, please go to USD’s Annual Giving webpage. Applications are being accepted now through Feb. 25, 2019, for alumni and legacy scholarships offered at the University of San Diego.